A few weeks ago me and my boyfriend Alex took the short and sweet train journey over to Manchester to have a little explore and shop around. I took a few little snaps so I thought I would turn this into a blog post and show you guys what we done and give you a little inspiration for a trip or even a what you can do in the city. 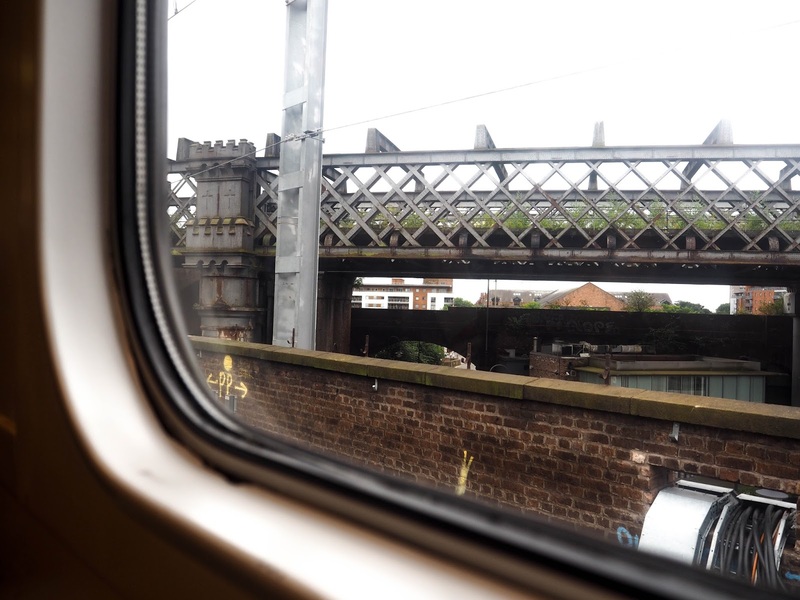 So we started off the trip with the train from Lime street station over to Manchester piccadilly a super short (only 50 minute) journey. We walked down to Piccadilly gardens and then headed from there over to the Northern Quarter, A MUST if you’re spending the day there! From vintage shops to incredible burgers and street art there is so much to do and explore. I know there are a few cool street wear brands too so it was the perfect combination of things for both me and Alex to do! From here we walked, talked and shopped in Pop Boutique, Cow Vintage and Oi Polloi! Sadly on this whole trip me and Alex didn’t find anything for our holidays however it was nice to look and see new in pieces and I always find that when vintage shopping you don’t always find pieces you need/want. We then headed out looking for the perfect burger! We strolled and found a place called ‘The Blue Pig’ located on High Street. We popped in and found that their burgers are half price on Mondays, which is amazing and meant our lunch out was really inexpensive yet still super delicious. 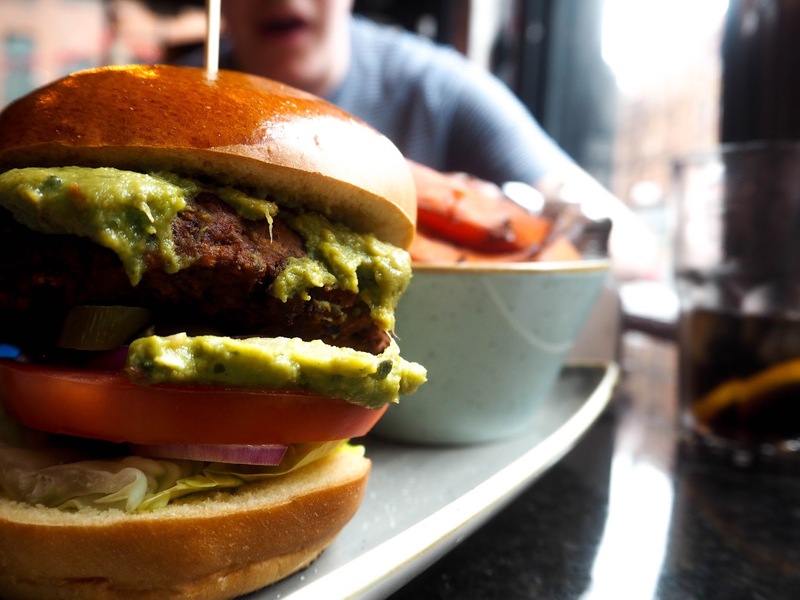 I of course got a freakin’ amazing falafel burger with guac and then obvious Alex treated himself to ‘A Dirty Pig’ burger. It was a great little pit stop bar perfect for grabbing a quick bite to eat. They also do small dishes too incase you’re not as greedy as us two. After some amazing food and a little bit more shopping over in the Andale we headed out to find Fred Aldous the most beautiful art supply store ever selling every colour card, every type of bead imaginable and beautiful cameras. 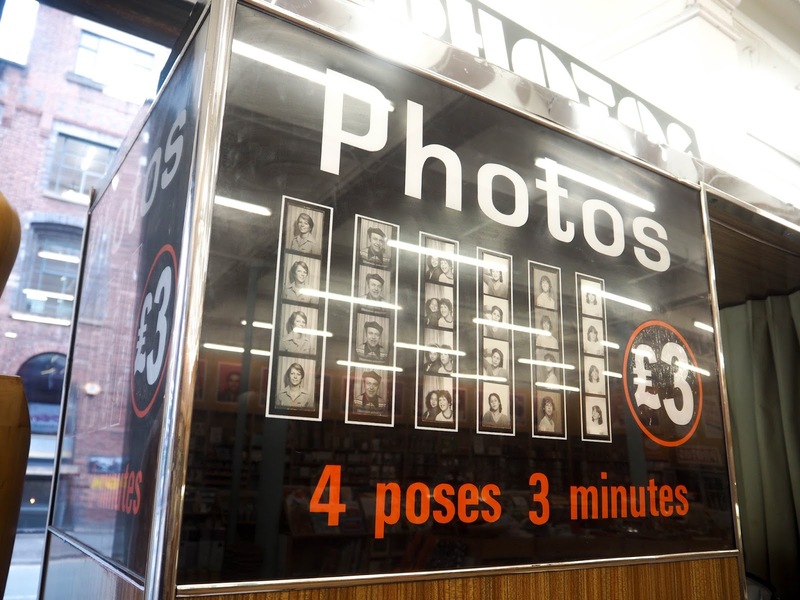 I wanted to go here to take a few snaps inter old fashioned photo booths. We had been before for a university assignment Alex helped me with but I said I wanted to pop back to get some special snaps own the two of us! Honestly it’s really fun and they have a couple different styled photo booths in their so you can capture as many memories as possible! 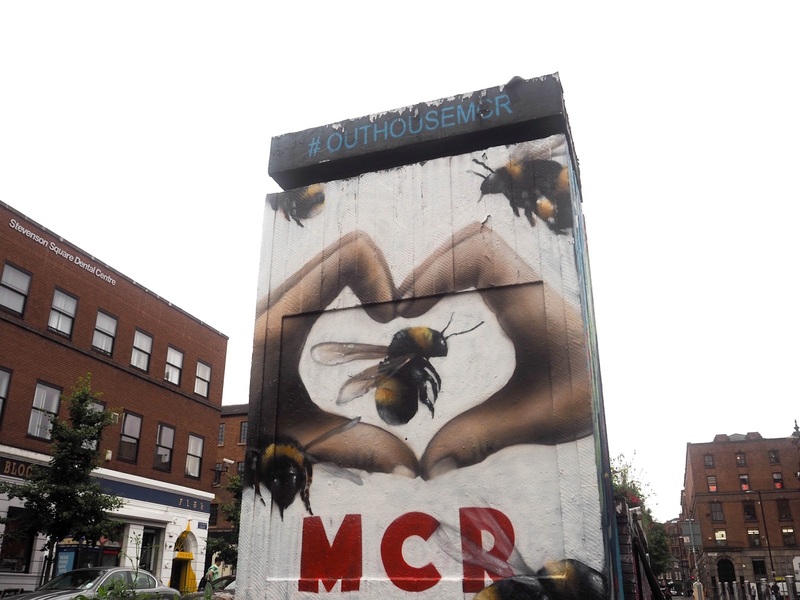 Now apart from doing all of the shopping and eating Manchester is full of incredible art work, it is everywhere. 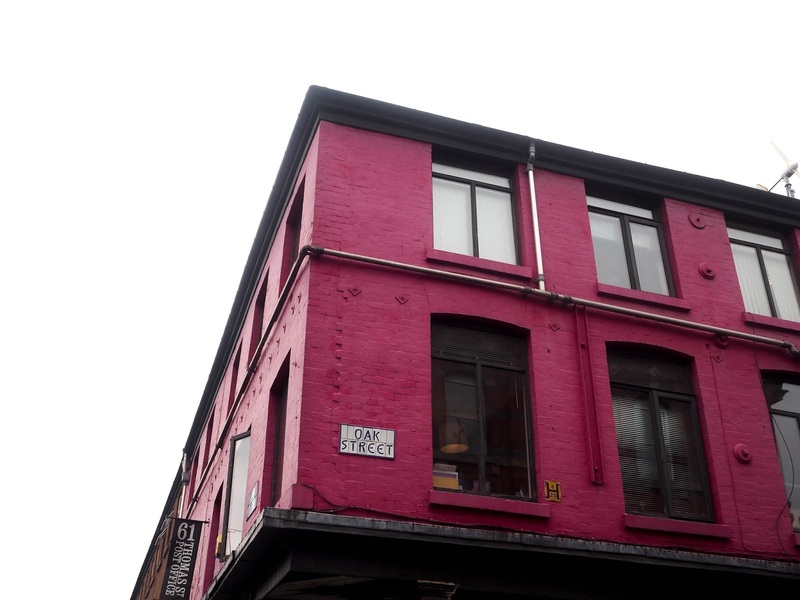 Every street corner has something new, something different and something interesting especially in the Northern Quarter. 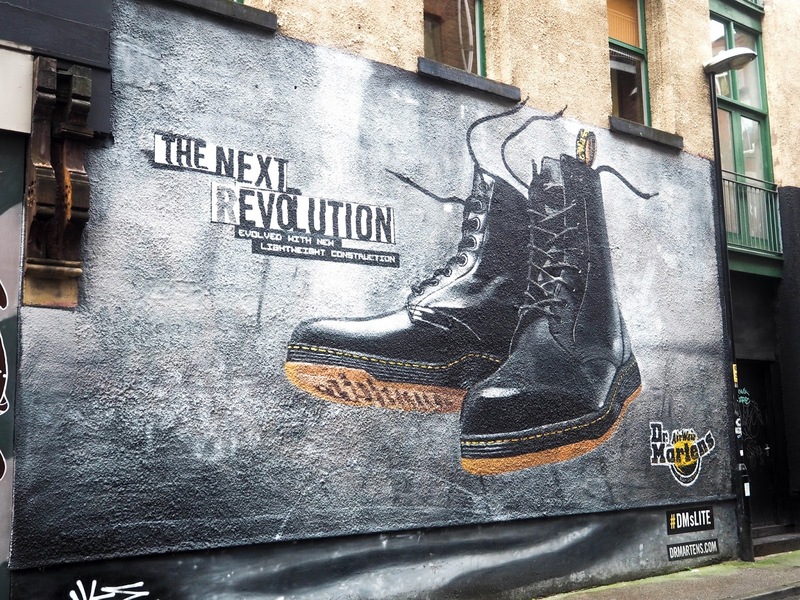 You can find a Dr Martens piece to a Fump Truck sign. Every building has a picture and a story so I do recommend exploring and looking up at the buildings rather than down! Of course this was just our little trip over to Manchester for a few hours but there is a ton to do! From museums and Exchange theatre to travelling over to the Trafford centre if you want a little more shopping. Or even seeing the football grounds if that’s what floats your boat. If not it is just nice to escape to a different atmosphere for a little while and people watch from cute cafe windows!